1 Manifold, Divergence and Dually Flat Structure.- 2 Exponential Families and Mixture Families of Probability.- 3 Invariant Geometry of Manifold of Probability.- 4 α-Geometry, Tsallis q-Entropy and Positive-Definite.- 5 Elements of Differential Geometry.- 6 Dual Affine Connections and Dually Flat Manifold.- 7 Asymptotic Theory of Statistical Inference.- 8 Estimation in the Presence of Hidden Variables.- 9 Neyman–Scott Problem.- 10 Linear Systems and Time Series.- 11 Machine Learning.- 12 Natural Gradient Learning and its Dynamics in Singular.- 13 Signal Processing and Optimization.- Index. I really like this book, and I would love to give it five stars. As I have some background in differential geometry, and currently work with large sets of data, I find the marriage between machine learning and differential geometry very appealing. Having said this, the resulting "information geometry" seems to have very little new insight to offer. Standard concepts and methods of statistics / machine learning are dressed up and reformulated in the language of differential geometry (with some effort), leading to new vocabulary but no new practically applicable methods and algorithms. Deep concepts of geometry such as that of the curvature or geodesic do not seem to translate into equally powerful concepts for data analysis. The book makes a wonderful reading for someone who enjoys the aesthetics of mathematics but do not expect to find in it anything that would help you with number crunching. This book is an updated review of the field by a main founder of Information Geometry. 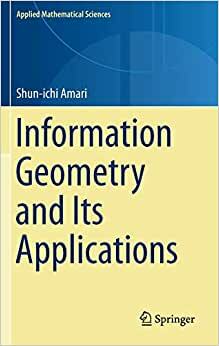 From the previous literature "Methods of Information Geometry," extensive update has been made. Far more references are added as sections / chapters, e.g. many recent results from after 2010 are cited and comprehensively explained. This book should be the new standard as an introductory textbook for the field. There is a mistake in the statement (and proof) of theorem 1.2 (Generalized Pythagorean Theoreom). The duality of the two geodesics are reversed in the statement (which you can confirm by proving the theorem). In the proof, (1.114) is the wrong part. The dual version of the theorem (where PQ is dual geodesic and QR is the primal geodesic) is also wrong accordingly. The part is not written precisely in the book (so the formulas don't make rigorous sense). I recommend reading Amari (1985) that is frequently cited in those sections if you want to follow the equations.